Packers defensive lineman Letroy Guion returns to a team that's 3-0 and firing on all cylinders. GREEN BAY, Wis. — The Green Bay Packers’ defensive line, instrumental in helping contain Seattle’s Marshawn Lynch and Kansas City’s Jamaal Charles the past two games, is about to get even stronger. 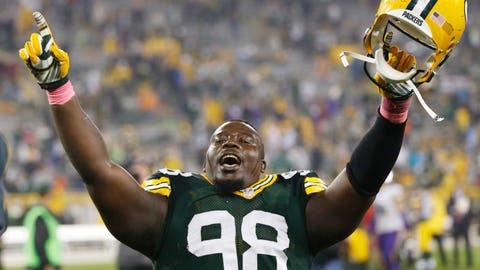 Letroy Guion, suspended for three games for violating the NFL’s substance abuse policy, returned to practice Wednesday. He practiced again Thursday and will be added to the 53-man roster in time for Sunday’s game at San Francisco. "Just from the strength and conditioning standpoint, I think he’s in excellent shape," coach Mike McCarthy said before Thursday’s practice. "Definitely in shape the way he was coming into camp. … he looks good." Just how good will determine if — or how much — Guion plays against a 49ers offense that features big running back Carlos Hyde and athletic quarterback Colin Kaepernick. He was arguably the Packers’ best run-stopping defensive lineman last season, when he replaced injured B.J. Raji at nose tackle and started all 16 games. However, the situation isn’t as dire this season. Raji is back after missing 2014 with a torn biceps tendon. DE Mike Daniels is one of the team’s top defenders. At the other end, Mike Pennel looks like an up-and-coming player. With those three leading the charge, the Packers held Lynch and Charles to a combined 90 yards rushing after yielding 141 to Chicago’s Matt Forte in Week 1. The defense had seven tackles for losses on running plays the last two games after getting zero at Chicago. "We’ve been pretty physical," Raji said. "I just think our IQ may be a little up. I have to give credit to the coaches for that. And also our technique has improved a little bit — drastically since I’ve been here. That’s allowed us to get off more blocks. I don’t think there’s ever been an issue of physicality. It’s been an issue of understanding and execution." Now, Guion is back in the mix. Among Green Bay’s defensive linemen last season, he ranked second in tackles, sacks, tackles for losses and quarterback hits despite missing almost all of training camp with an injured hamstring. Returning after a three-week suspension offers something of a parallel should Guion get thrown right back in the mix on Sunday. "He’s a veteran," defensive line coach Mike Trgovac said. "He’s been here working out. Unlike last year, when he was injured and then came back, he hadn’t had a lot of practice reps. He had training camp reps this year and he was working out here the three weeks he was suspended, so he’s in really good shape right now. Always with football, you can’t simulate football with anything. He worked hard in practice this week to get his timing back; you’re not going to be perfect the first time you’re out." Guion returns to a team that’s 3-0 and firing on all cylinders. "Very excited," Guion said. "Most of all I’m excited to get back out there with the fellas and start to play some football." NOTES: RB Eddie Lacy was full participation for a second consecutive day after being slowed by an ankle injury last week. "It definitely feels better," he said. "It’s a shorter week, but I’m still able to get a lot of rehab in and get it for this week. But this weekend I’ll be ready to go, just like last week." . Two other starters, S Morgan Burnett (calf) and WR Davante Adams (ankle), did not practice again.